Because latkes aren't just for Hanukkah. Who says latkes are just for Hanukkah? Well, it’s not me. 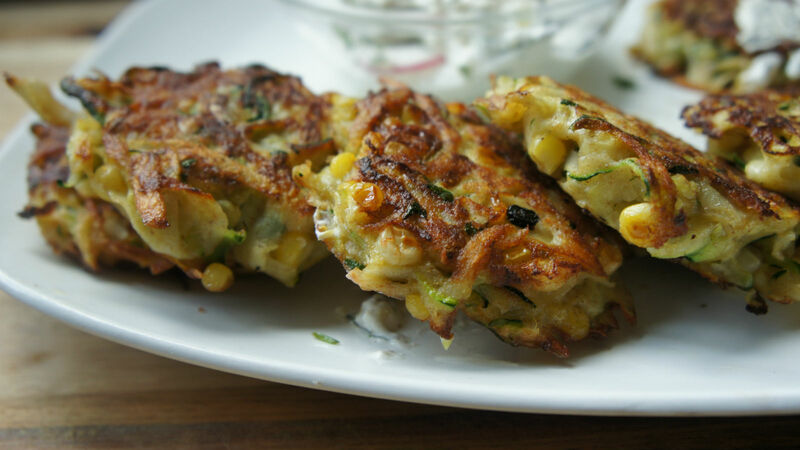 And summer is a great time try using seasonal produce to make some crispy, delicious latkes. I recently fried up some fresh corn and zucchini latkes, served with herb sour cream (or yogurt) and thinly sliced radishes. The texture of the fresh corn with zucchini and potato was so delicious. If you’re looking for other ideas for non-potato latkes try broccoli stem latkes or even these healthful spaghetti squash and quinoa fritters from Julia’s Album, which after all, is just another name for latke. Cut ends of zucchini and coarsely grate. Place in a large bowl with 1/4 tsp salt. Allow to sit for 20 minutes. After 20 minutes, place shredded zucchini in a kitchen towel and wring out excess water. Places shredded potato, zucchini, corn kernals, eggs, flour and 1/4 tsp salt in a large bowl. Mix until combined. Heat 2-3 Tbsp vegetable oil in a large saute pan over medium high heat. Form mixture into patties, size should be approximately 1/3 cup. Cook latkes until golden and crispy on first side, around 3-4 minutes. Flip and cook for another 2-3 minutes. Place onto a wire baking rack and add a pinch of salt immediately. To make the herb sour cream (or yogurt): combine sour cream, chopped herbs, lemon zest and 1/8 tsp salt. Combine and serve with hot latkes. Garnish with thinly sliced radishes if desired. The perfect way to use leftover noodles. Could there be a better Ashkenazi-Sephardi combo than latkes with dates?